Potatoes and rosemary is a classic flavour combination. Combined in a lovely gratin with zippy cheese makes potatoes even more delicious. Peel potatoes and cut into chunks. In a large pot, cover potatoes with cold water; bring to a boil over high heat. Season water with 1 tsp (5 mL) salt. Reduce heat and boil gently for about 15 min or until fork tender. Drain; return pot to low heat for 1 min to dry, shaking often. Meanwhile, in a saucepan or in a microwave-safe measuring cup, combine Milk, rosemary and pepper. 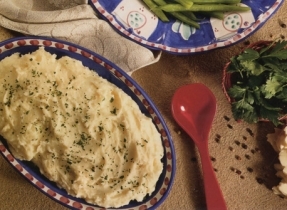 Heat, uncovered, over medium heat on stove-top or on Medium (50 %) power in microwave until steaming, for about 3 min. Preheat broiler. Butter 8 large ramekins or a shallow 8-cup (2 L) baking dish. Mash potatoes while gradually adding warmed Milk mixture. Mash in 1 cup (250 mL) of the cheese and 1/4 tsp (1 mL) salt, or to taste. 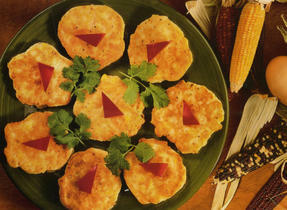 Spread into ramekins or baking dish and sprinkle with remaining cheese. Broil for about 3 min or until cheese is golden. The potatoes can be prepared ahead. Spread into ramekins or baking dish and let cool (don't sprinkle with cheese for topping). Cover and refrigerate for up to 1 day. Reheat, covered with foil, in 350 °F (180 °C) oven for about 35 min for ramekins or 45 min for large baking dish. Uncover; sprinkle with cheese and broil to brown top. 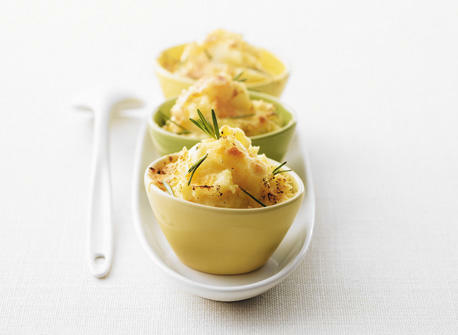 For the Adventurous: Add 4 cloves roasted garlic when mashing potatoes and replace the 1/4 cup (60 mL) cheese for topping with crumbled blue cheese.